Things are looking up. It is getting easier for those of us who need to be gluten-free to eat out safely. It used to be hard enough to find a restaurant with a gluten-free menu. Then, once you found a restaurant with a gluten-free menu, the menu often only offered salads with one safe dressing and meat, but only when ordered with no seasonings. This was because restaurants often have their own "signature" seasonings, which are kept from clumping together by adding wheat flour. More recently, some of the restaurants have started offering more gluten-free salad dressings, more meat and seasoning offerings, and even a dessert or two! Now things are even better yet. Now, a few restaurant chains are leading the way for us by offering gluten-free pizza, gluten-free pasta dishes, gluten-free salads, gluten-free soups, gluten-free meat and veggie combos, and even gluten-free desserts! And more than just a scoop of ice cream, too! BJ's offers all of those things and yet it stands above all of those other restaurants for one very, very simple reason. BJ's gluten-free menu is the first restaurant gluten-free menu I have seen that also lists beverages! It amazes me that a thing as simple as beverages can be what sets them apart. Okay, okay, it is actually more than that. They offer a variety of gluten-free options. Yes, they have salads, but not just salads. I was sorely tempted by the gluten-free pizza. But traveling over the holidays wasn't conducive to eating well, so I chose to eat lighter. Look at that! BJ's also has gluten-free soups! This really is monumental, since I think I have been to only one other restaurant that offered a gluten-free soup. BJ's offers two! I had to try one. Since I was avoiding the gluten-free pizza in an effort to eat lighter, I also avoided the gluten-free broccoli cheddar soup. Sounded delicious, but definitely not light. 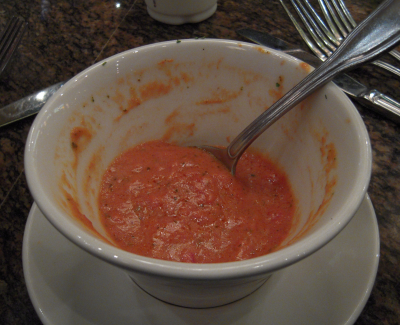 That left me with the choice of the Tuscan Tomato Bisque. As I've mentioned before, I love tomato bisque! I had to try BJ's version. Ooops! It took awhile for me to remember to take a picture! We had been waiting for a table for too long, and we were all getting hungry and grumpy. By the time this bowl was put in front of me, the camera and a picture was almost the furthest thing from my mind. It was so good that I scarfed down half of the bowl before coming up for air. Sure, I was hungry, but this soup was good. Very good. I highly recommend it. For my main course, I chose one of those dreaded gluten-free salads. Expect that I don't dread them. I usually like them. 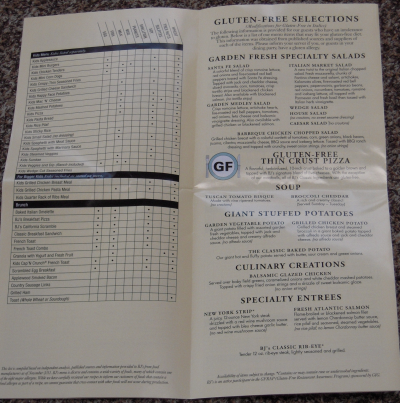 They just seem to be the most common item on gluten-free menus, so they can get a bit monotonous. This time I ordered the Italian Market Salad, which includes fresh mozzarella, chunks of salami, and artichokes, among lots of other things. This is anything but a boring salad. 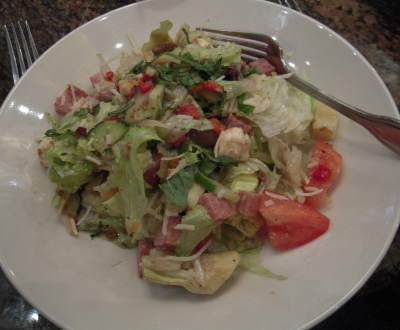 This is a fabulous salad! And I even remembered to take a picture before I dug in. With one other gluten-free eater in our party, our table ordered a couple of other gluten-free items. 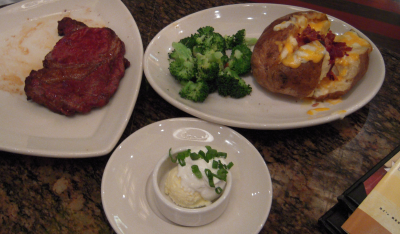 Here are the BJ's Classic Rib-Eye and the Grilled Chicken Potato, straight off the gluten-free menu. That baked potato comes with steamed broccoli and jack and cheddar cheeses. I didn't eat an of these, but I got word that they were good! BJ's is a restaurant found in thirteen states, most of which are west of the Mississippi. Locations can be found in California, Texas, Arizona, Colorado, Oregon, Nevada, Florida, Ohio, Oklahoma, Kentucky, Indiana, Louisiana and Washington. If you happen to be lucky enough to have one near you, try them! I don't think you will be disappointed. Oh, and just in case you were wondering, BJ's Restaurant and Brewhouse does offer gluten-free beer! I ate this restaurant in Tuscon and the pizza was wonderful. It was the best that I have eaten since having to be gluten free.